Handrail standards and handrail fittings are essential components to the installation of steel walkways. We offer a wide range of handrail standards such as flat base / side palm & raked. For more information give us a call or fill in a request a quote form. Handrails for stairs are vital in ensuring that stairways are safe, secure and also demonstrate aesthetic structure. These handrails can also be implemented to prevent falls on rooftops and can be installed to attempt to prevent hazards presented by water. In industrial environments, these handrails can greatly enhance worker welfare due to the fact that these handrail standards (combined with handrail fittings) prevent falls and accidents. These fittings can also be used in modern designs and are not just limited to industrial environments as many other buildings often implement industrial designs. Our handrail standards and fittings provide safety and ease of installation, creating a fantastic product and an ideal handrail for stairs. It is also a health and safety obligation to have handrails in areas of worker traffic flow. The HSE explains that “a secure and substantial handrail should be provided and maintained on at least one side of every staircase” (unless it blocks an access route). 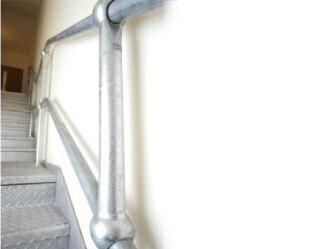 South West Steel offers a wide array of handrail standards and fittings. If you are looking for these products and wish to see dimensions and prices then do not hesitate to contact us today for a free quotation.